The most common tribute paid to Hill today is “he wasn’t everyone’s cup of tea, but…” There were plenty of people who couldn’t stand him in the days when he presented Match of the Day and he often seemed to attract impersonations which portrayed him as a rather tedious bore with a big chin. But hindsight at least has generally earned him greater respect in terms of having had courage in his convictions and trying to give a proper assessment of what he had seen. If many football experts are criticised for not appearing to truly tell it like it is, it was not a charge that could be made against Hill. It wasn’t his worry if most viewers were going to disagree with his opinion as he believed he was right anyway. Although he had never been good enough to play for his country, Hill’s later career in television saw him cover many England matches from the mid-1960s through to the late 1990s and he was seen as a leading voice on their fortunes. In the same way as he performed multiple roles within football, Hill also proved a utility man in television. Provided the BBC had the rights to an England match – and ITV in the few years before he switched channels in 1973 – you could almost guarantee Hill would be putting in an appearance as a presenter, pundit or co-commentator (sometimes doing more than one role on the same broadcast!). He was never short of an opinion, nor was he afraid of who he might upset by making it. Covering England – and the other home nations – is just about the one instance where pundits can be forgiven for showing clear bias in favour of one team or for looking at things purely from that side’s perspective. Hill was not afraid to show pride in being English – but he would also willingly express his frustration as he witnessed the 30 years of hurt (and more) after 1966 at close quarters. The 1960s saw Hill grow in national prominence, successfully fighting for the abolition of the maximum wage in his capacity as PFA chairman and then enjoying a successful stint as manager of Coventry City. Hill had – by his standards – a fairly minor role in the BBC’s 1966 World Cup coverage. When England met Argentina in the quarter-finals, Hill was alongside Kenneth Wolstenholme as ‘summariser’ (co-commentator in today’s money). The infamous moment when Argentine captain Antonio Rattin was sent off and all hell broke loose saw Wolstenholme quip to Hill: “Well they don’t get this at Coventry City, do they Jim?” Many would have simply chuckled but Hill wasn’t going to miss his chance to share a bit of expert knowledge and instantly replied: “Well as a matter of fact, an Argentine team did once play at Coventry City which ended at half-time because they walked off under similar circumstances…” Alas,such insights did not earn him a similar role for England’s semi-final and final. 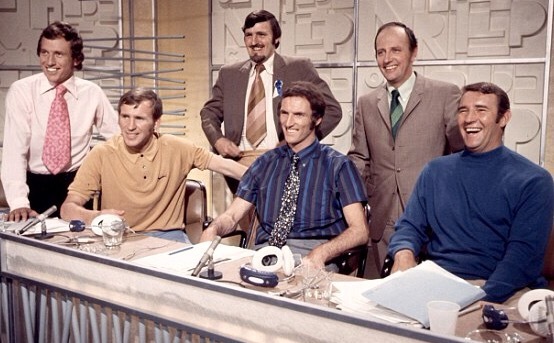 Jimmy Hill and the famous ITV panel in 1970. The following year he surprisingly quit Coventry after winning promotion and joined London Weekend Television full-time. He helped develop The Big Match as a strong competitor to Match of the Day and in 1970 took much of the credit for devising ‘the panel’. It was seen as revolutionary during that World Cup in Mexico to have experts debating the match in the studio at half-time (with things often getting quite heated), with Malcolm Allison, Pat Crerand, Derek Dougan and Bob McNab playing their part in ITV unusually beating the BBC in the ratings. The concept perhaps cemented Hill’s reputation as an innovator (he would later claim credit for the introduction of three points for a win). Three years later, Hill was lured across to the BBC as MOTD host – becoming synonymous with the show. This role saw him continue to offer his views on England matches, although he would have to wait until 1982 to cover them at a World Cup while with the Beeb. Hill was in the presenting chair at Wembley the night they finally made it by beating Hungary in November 1981. “We’re so grateful we didn’t have to end off this programme saying England didn’t qualify,” he said with relief at the end of an emotional night. 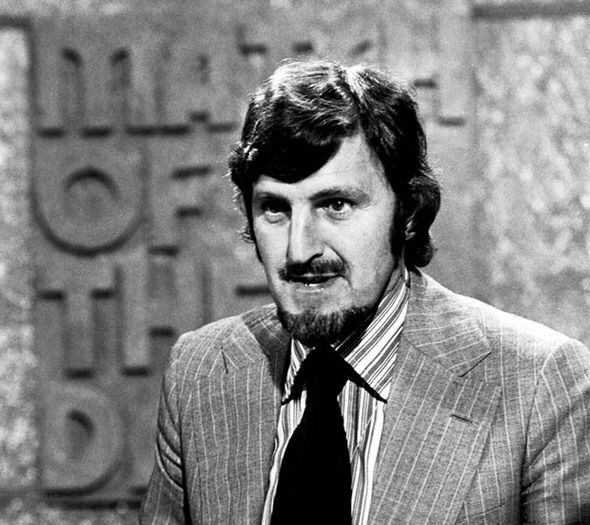 Jimmy Hill was Mr Match of the Day for many years. One unfortunate issue during the Hill years was the frequency of crowd trouble, often rearing its ugly head when England travelled abroad. Where some pundits may have not seen it as their duty to provide an analysis of the problem and would have wanted to simply discuss the football, Hill assessed it to a great extent – and would look at it from beyond just a footballing perspective. He would express his disgust but you could almost guarantee he would be describing it as “a society problem” and coming up with what steps he thought should be taken to help resolve it. For example, his analysis of England’s match in Ireland in 1995 due to crowd trouble saw him call for identity cards to be worn by everyone. Not that such views were always appreciated by viewers of course. Thirty years on from the event, Hill has been receiving retrospective criticism lately in the letters pages of When Saturday Comes for his line of questioning when hosting the BBC’s live coverage of the Heysel Disaster as he probed Graeme Souness and Terry Venables on whether national service should be reintroduced. 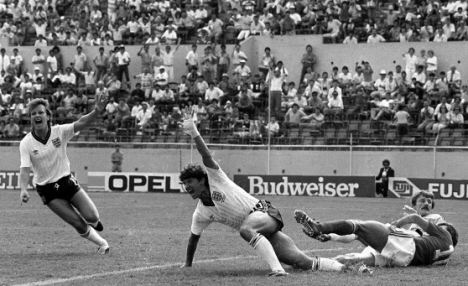 Controversy was something never far away from Hill in his broadcasting years and you could fill several blogs on the subject, including how some Scotland fans have never forgiven him for describing David Narey’s goal against Brazil in 1982 as a “toe poke”. But let’s keep reminiscing about his England years instead. Hill was never an out and out presenter. Even during his 15 years hosting MOTD he would usually appear only as a pundit on Sportsnight, often popping up to analyse England matches (imagine Gary Lineker appearing as an analyst on another BBC show today?). He also frequently took on the role of co-commentator, usually performing that role at major tournaments until the late 1980s rather than hosting from the London studio. Probably his most memorable contribution as a co-commentator came when England took on Poland in a do-or-die match in the 1986 World Cup and it did not involve any pearls of wisdom or controversial views. As Gary Lineker put England into a crucial early lead, Hill could be heard chortling with delight as he sat alongside Barry Davies. His reaction fitted the mood of the English nation at that moment and showed that for whatever criticisms he aired, deep down he wanted his country – and his old mate Bobby Robson – to succeed. Lineker scores and Jimmy howls with joy. Although Hill stopped short of becoming a lead commentator, he came pretty close to it when England took on Scotland in the Home Internationals at Wembley in June 1983. While analysing a previous incident, England bore down on goal. Rather than follow the usual protocol of handing the mic back to John Motson, Hill decided to keep talking and describe what was happening. “And here’s Trevor Francis now on the edge of the box… He shoots… And he’s scored….” Motson sounded almost relieved the goal was disallowed, pointing out “the whistle definitely went while Jimmy was talking” as if to stress his irritation that he hadn’t been able to perform his usual role. Like so many others, he found trying to shut up Jimmy Hill wasn’t the easiest task in the world. From 1988-89, a beardless, bespectacled and greying Hill was now just a pundit as he ended his presenting and co-commentary duties. In some respects punditry suited him more naturally than presenting as it meant he could express his views without being responsible for making sure the show finished on time or rushing to the next link. Hill just loved talking about the game and England’s fortunes were central to this. And he had good company. Over the next five years or so he would often be joined for England matches by Terry Venables, a man who was not afraid to disagree with Hill. Although they would occasionally be together for domestic games, Venables’ club commitments meant he was more frequently available for internationals and that was when their partnership thrived. They were the proverbial old married couple, seemingly unable to agree on anything and almost not wanting to either. This half-time analysis of England away to Sweden in 1989 is an example of that, as the pair disagreed over whether Gary Lineker was at fault for missing a chance and then about if England should look for a winner or take the draw – Hill going against his usual stance of wanting to see flair from England by declaring he didn’t care what they did as long as they kept it at 0-0. There was less warmth on show when analysing England’s 6-0 win over San Marino in February 1993, with Hill visibly annoyed by how Venables had taken his contributions and looking willing to start a proper row while on air. Hill and Venables – a disagreement was never far away. It all made for good television and there was a crucial third player in helping the double act thrive. 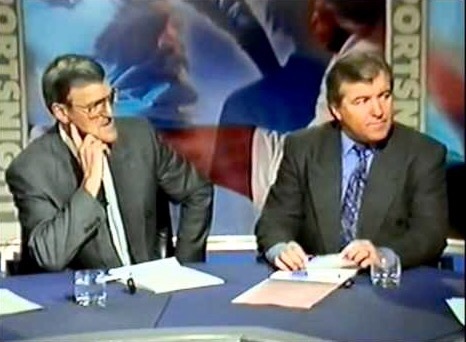 Des Lynam, who had replaced Hill as MOTD presenter and then also took over on Sportsnight, seemed to relish the fact that the pair would argue. He knew what questions to ask to get them going. His laid back manner complemented the duo well. Not that it was always easy for him. On several occasions he had to cut Hill off in full flow so they could finish the broadcast on time. And one sensed Lynam wasn’t overjoyed when Hill pointed out to millions of viewers during live coverage of England against the Republic of Ireland in 1991 that Des was born in Ireland, with all the subtlety of a young boy telling his parents where he had found his big brother’s dirty magazines. One distinctive element of the Lynam/Hill/Venables era was they would award marks out of 10 to England’s performance at the end of each analysis. This wasn’t particularly important, but Hill took it most seriously. Whereas Venables would swiftly give a response of say eight, for Hill it was literally a case of no quarter given. Ratings such as “seven and three quarters” would be aired, along with other more convulted responses such as “I was going to say seven out of 10 but now I wouldn’t go above five and a half for that performance” as he reconsidered his view live on air. Jimmy Hill had played at club level with both Ron Greenwood and Bobby Robson and retained a good rapport with them. This didn’t though prevent Hill from criticising England and their management when he thought it necessary. 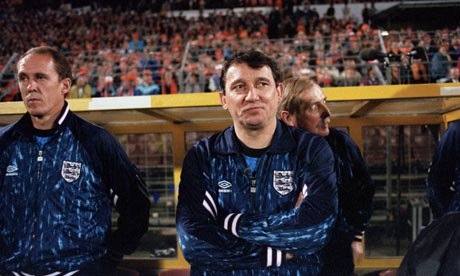 But one sensed Hill felt far more affection for these managers than Graham Taylor, who replaced Robson in 1990. Despite England rarely losing in Taylor’s first two years in charge, Hill raised concern over the performances he was seeing and some of the players being selected (his attitude probably not helped by Peter Beardsley, a player he hugely admired, being axed). Graham Taylor: Not a member of the Jimmy Hill fan club. It wasn’t the first or last time Hill had talked his way into controversy, but Taylor’s reaction was over the top and summed up his tetchy mood during Euro ’92. One assumes Hill did not shed too many tears for Taylor when he lost his job the following year after failing to qualify for the World Cup – which paved the way for someone he knew very well to lead his country. In November 1993, England’s slim hopes of making the World Cup finals ended after their 7-1 win over San Marino proved academic. On Sportsnight that night it was time for a proper analysis by Hill and Venables of England’s failure to get there, as Taylor faced the axe. They did a good job, Hill making perceptive comments that still rang true many years later about the problems with the set-up of youth football in England and the lack of real talent available. Venables put his shift in too, while fellow pundit John Toshack was never asked for his opinion and didn’t dare to offer one. Venables was non-committal about whether he would want the England job if offered, but by the time England next took to the field four months later he would be in charge. And so that proved the end of the Hill-Venables years when covering England, with Hill’s old sparring partner soon moving to ITV to end their double act altogether. 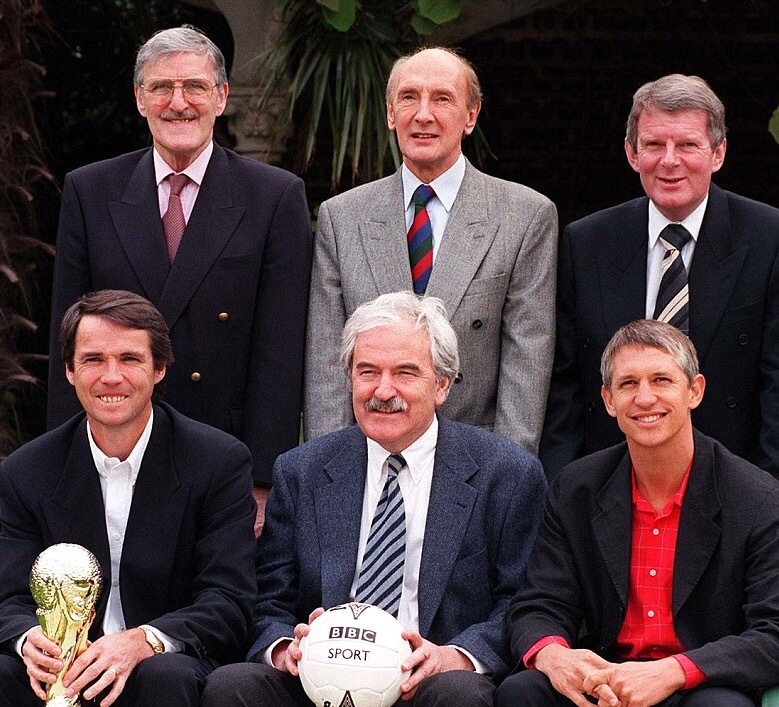 Alan Hansen stepped up to the role for England matches and in many respects was a good replacement for Venables, not being afraid to express views which differed from Hill. But it was never quite the same. The age gap was bigger than between Hill and Venables, there seemed a bit less natural chemistry and Scotsman Hansen understandably did not share Hill’s passion for England. Jimmy Hill wears his infamous England bow tie alongside a new breed of pundits – Ruud Gullit and Alan Hansen. Hill soon found his powers on the wane as a young generation of pundits emerged, effectively being relegated to third choice behind Hansen and Ruud Gullit at Euro ’96. At least when England played live on the BBC during the tournament he had a place on the panel, including for the semi-final against Germany. To the surprise of the watching millions, they tuned in to find Hill wearing a bow tie containing the cross of St George. No doubt Gok Wan wouldn’t have recommended such attire but Hill certainly couldn’t be accused of being unpatriotic – and he remained perceptive. “I think it’s 50-50 – you could toss a coin,” he said Hill prior to the semi-final and he was spot on, given just how close the match would be. 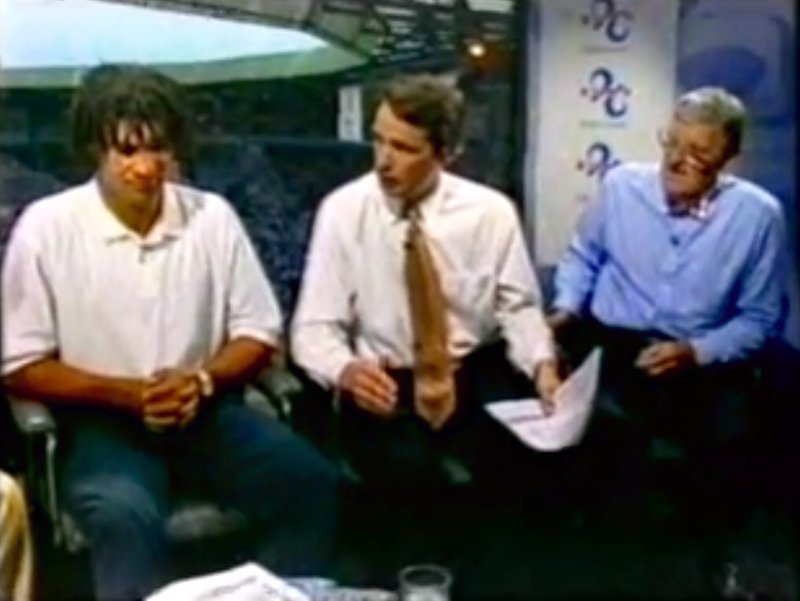 The last hurrah: Hill and the other key BBC men from the 1998 World Cup. Sorry this has been a long blog but it seems fitting when writing about Jimmy Hill, a man renowned for talking away at length. During his many years in the media Hill, who sadly now has Alzheimer’s, certainly was not universally loved. But he was synonymous with football and television in this country and, by association, with the England team. He joined the BBC while Sir Alf Ramsey was still managing England and left it while Glenn Hoddle was at the helm, working on countless games they played. England matches seemed to bring out the best of him as a football analyst. Although he wasn’t afraid to be very critical of what he saw from England – even having a moan sometimes if they ground out a decent-looking result if he felt they had looked inferior technically – he cared about them. I can’t really think of an equivalent to him in today’s football in England. He certainly was something of a one-off, proving a jack of all trades by performing so many different roles within the game. Hill probably considered himself a master of many of them too – and who are we to argue?